Businessmen are being warned that tax evasion may soon be considered a serious criminal offence. Putin has made it clear that he views the tax-related clauses of the current criminal code as ineffectual and has promised to go against officials who have dared to publicly disagree with his initiative. Putin explained he wanted the Investigations Committee to receive preliminary inquiry materials from the Interior Ministry, so that he can decide for himself whether or not to open an official investigation into each potential tax evasion case. Putin has said he believes some of the Russian regions have stopped opening such cases altogether. "We have in essence left it to the tax inspectorate to decide whether or not to [launch inquiries into tax evasion cases]," the president said, citing statistics from Moscow, where a total of 1 billion rubles ($31 million) had to be repaid to the budget by tax evaders in accordance with court orders, but only 4 million rubles was actually paid back. "This translates [nearly] to nothing," Putin said. "Meaning that the [relevant criminal code] clauses have simply stopped working. Out of all the [tax evasion] cases processed, only three persons got indicted, and two of these three got suspended sentences." Liberalization of the Russian criminal law has resulted in a dramatic decline in inquiries into tax evasion cases, according to Alexander Brechalov, the president of the Opora Rossii (Russia's Mainstay), which promotes small- and medium-size business. So far, only 2,000 such inquiries were initiated in 2012, against 12,000 to 13,000 in 2009 and 2010, respectively. Prime Minister Dmitry Medvedev in early November criticized Putin's initiative, saying that the overall number of newly instigated criminal inquiries could not serve as a reliable indicator of the law enforcement agencies' effectiveness: "You can launch as many inquiries as you want, especially so if you are paid to do that, as was unfortunately quite often the case when one [business] structure was fighting another [back in the 1990s in Russia]." The Russian business community is also against Putin's proposal. Experts warn that broadening the remit of the security agencies could easily lead to embezzlements of their powers, while not improving the crime solution statistics. Putin, meanwhile, said he expects no problems from the possible introduction of the new measure. "I fully appreciate the concerns of the business community, and we must find a way to serve the interests of the state while avoiding any damage to the business climate." 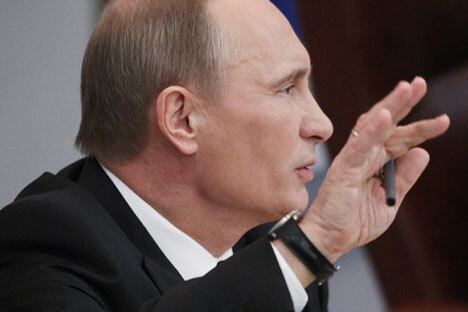 Putin spoke much harsher of his outspoken critics among state officials. "I will have to remind them that there is a certain decision-making procedure that must precede any statements for the media. It is well known that if someone disagrees with something, like [former Finance Minister Alexei] Kudrin did, that person will become a part of the expert community [rather than a member of the government]." Nikolai Ostarkov, the vice-president of the Business Russia public association, said that if the amendments are passed into law, “we may return to the times [back in the 1990s] when tax evasion-related inquiries into business people's activity would be launched in order to square accounts with a rival or put pressure on a company's general manager to make them take a certain decision." Igor Yurgens, the vice-president of the Russian Union of Industrialists and Entrepreneurs, said he fears the Investigations Committee will be as ruthless in launching spurious inquiries as part of rival wars between companies as the Interior Ministry has been up to now. "The Investigations Committee does not enjoy the reputation of a smooth and cultured agency with the business community," he said. Prominent Russian businessman Mikhail Prokhorov has launched a campaign to collect some 100,000 signatures against Putin's proposal, which he has called a dangerous trend. Prokhorov said he believes Putin's amendments would impact the investment climate in the country, forcing business to go in the shadow. Based on materials from Kommersant and Vedomosti.